What if there had been no lockout? What if the NHL owners hadn’t canceled almost half the 2012-13 regular season, lowered the 2013-14 salary cap and assured the cap wouldn’t rise at the same rate in the future? How crazy would Friday have been then? Because it was nuts, anyway. Despite the reset of the system, teams still spent more than $300 million on free agents in the first few hours the market was open. Even though the players are making less of a percentage of revenue and contract lengths are limited, guys still got paid and received long-term commitments. Ottawa Senators: The Senators are a better team, but they’re worse for it. They signed left winger Clarke MacArthur to a two-year, $6.5 million deal and traded for right winger Bobby Ryan. They sent a first-round pick and two good prospects to the Anaheim Ducks, because Ryan is a 26-year-old, four-time 30-goal scorer signed for two more seasons at a $5.1 million hit. Ryan replaces a 40-year-old right winger who signed a one-year deal with a $5.5 million hit elsewhere. Problem is, that 40-year-old right winger was Daniel Alfredsson, an Ottawa icon, the Senators’ longtime captain, and the plan was to acquire Ryan and keep Alfredsson, not to acquire Ryan to replace Alfredsson. Owner Eugene Melnyk and GM Bryan Murray mishandled the Alfredsson situation, rejecting his opening offer and then offering a blank check when it was too late. So now Alfie, once the most popular figure in Ottawa, will chase the Stanley Cup with the Detroit Red Wings, the Sens’ division rivals next season. A shame. Toronto Maple Leafs: It is important for the GM and coach to be on the same page, and David Nonis is on the same page with Randy Carlyle the way Brian Burke wasn’t with Ron Wilson. But was it wise to buy out center Mikhail Grabovski and re-sign Tyler Bozak for five years, even though Grabovski had a $5.5 million cap hit and Bozak’s will be $4.2 million? Grabovski had a bad year under Carlyle but is a far better player. And as much as David Clarkson fits the Carlyle mold, should the Leafs have given him seven years at $5.25 million per? Clarkson will add grit on the wing and character in the room, but outside of one 30-goal season in 2011-12, he has never scored more than 17 goals. He has never produced more than 46 points. He had 15 goals and 24 points in the 48-game, lockout-shortened season, but he started hot and cooled considerably. This is the longest contract in Leafs history. This has regret written all over it. New Jersey Devils: How did the Devils replace Clarkson? With a deal that was even worse – the worst deal of the day. They signed winger Ryane Clowe to a five-year contract with a $4.85 million annual cap hit. Yes, the same Ryane Clowe who reportedly suffered four concussions in 14 months, the same Ryane Clowe who scored only three goals last season. Three. Clowe is a good guy who has come up big in the playoffs in the past, and he had some particularly bad luck last season. But he is slowing in a game that is accelerating and should not have demanded that money or that term. The Devils signed Michael Ryder to a more reasonable two-year, $7 million deal. Philadelphia Flyers: In light of some of the moves on Friday, the deal with Vincent Lecavalier doesn’t look as bad. The $4.5 million cap hit isn’t that bad. The problem is the five-year term. Though Lecavalier still has good hands and can still be effective below the dots, he doesn’t skate like he used to at age 33 with more than 1,000 games of mileage. There is a reason the Tampa Bay Lightning gave him more than $30 million to buy out what was supposed to be a lifetime deal. Other teams didn’t want to give Lecavalier more than two years. After buying out Danny Briere and Ilya Bryzgalov, the Flyers might have made another long-term mistake. Philadelphia did make a great move, however, by signing goaltender Ray Emery to a one-year, $1.65 million deal. Emery is a former Flyer who has overcome a hip condition and went 17-1-0 as a backup for the Chicago Blackhawks last season. He’ll challenge Steve Mason for the top job. Phoenix Coyotes: Mike Ribeiro wanted a five-year deal in Washington. The Capitals wouldn’t give it to him; the Coyotes gave him a four-year deal with a $5.5 million hit. They have their reasons. The franchise appears to be staying in Arizona now that the Glendale city council has approved an arena lease, allowing a new ownership group to buy the team from the NHL. The team needs to market itself, and it needs offense. Coach Dave Tippett once got the best out of Ribeiro with the Dallas Stars, too. But that’s a lot of term and a lot of dollars for a 34-year-old who padded his numbers on the power play with teammates like Alex Ovechkin and Mike Green. Can he do the same with Shane Doan and Keith Yandle? Can he do it as he ages? Columbus Blue Jackets: Nathan Horton decided he didn’t want to play on a line with Milan Lucic and David Krejci. He decided he didn’t want to play for the Boston Bruins despite winning a Cup and going back to the final with them. He decided he wanted a quieter life. It sounds like a big break for the Blue Jackets, who have been making strides under new management. The $5.3 million cap hit is fine for a guy who can put the puck in the net. But the seven-year term is a huge concern for a player with a concussion history and a chronic shoulder injury. Horton will start his career in Columbus by having shoulder surgery and sitting out for four to six months. 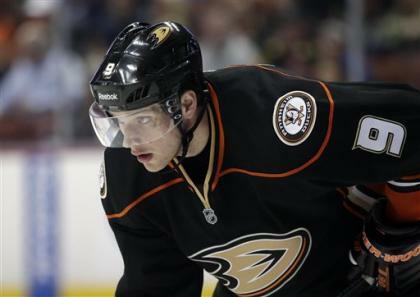 Anaheim Ducks: Finally, after so many rumors, the Ducks traded Ryan, who became expendable especially after they gave extensions to Ryan Getzlaf and Corey Perry during the season. They received two excellent prospects from the Senators in Jakob Silfverberg and Stefan Noesen, plus a first-round draft pick. But the jury will be out until we see how those prospects develop and what that pick becomes. Boston Bruins: The Bruins have parted with six players who dressed for Game 6 of the Cup final: Horton, Andrew Ference, Jaromir Jagr, Tyler Seguin, Rich Peverley and backup goaltender Anton Khudobin. They have brought in Loui Eriksson, Jarome Iginla and a couple of prospects. Swapping Seguin for Eriksson makes sense in the short term, because Seguin needs to grow up and Eriksson is a finished product and excellent two-way player, and the deal with the Dallas Stars did come with those prospects. But it might bite them in the long run because Seguin is only 21 and has so much potential. They struck out on Alfredsson. They added Iginla, who spurned them at the deadline for the Pittsburgh Penguins (and was a non-factor against Boston in the Eastern Conference final). At least Iginla’s deal is for only one year at $6 million, and at least he will play right wing, his natural position, instead of left wing, as he did in Pittsburgh. Nashville Predators: The Preds needed help up front. They could have claimed Grabovski off waivers, giving them the kind of top-six centerman they were unlikely to land in free agency. But they didn’t. Instead they signed four less spectacular forwards: Matt Hendricks (four years, $1.85 million annual hit), Matt Cullen (two years, $3.5 million cap hit), Viktor Stalberg (four years, $3 million hit) and Eric Nystrom (four years, $2.5 million hit). They will be deep and hard to play against, as they often are. They know how to win this way. This is their identity. But they needed more skill and passed on an opportunity to get it. Montreal Canadiens: This is a small team, and the Habs decided to sign Briere, a 5-foot-8 forward who is fading badly at age 35 and was bought out by the Flyers. They gave him two years at a $4 million hit. At least they showed some restraint on the term. They also traded for George Parros, the smart, mustachioed enforcer who will keep the bad guys from picking on their little guys. Tampa Bay Lightning: They paid more than $30 million to buy out Lecavalier because they could see problems down the road, and that opened a hole at second-line center. They replaced him with Valtteri Filppula. GM Steve Yzerman knows Filppula well from his days as a player and executive with the Detroit Red Wings, but that makes it more puzzling. His mentor, Ken Holland, wouldn’t meet Filppula’s demands for a reason, yet Yzerman gave Filppula five years at a $5 million cap hit. Pittsburgh Penguins: Those big deadline acquisitions? Iginla is gone, and Brenden Morrow and Douglas Murray have not been re-signed. Matt Cooke (Minnesota Wild) and Tyler Kennedy (San Jose Sharks) have signed elsewhere, too. But at least the Penguins brought back defenseman Rob Scuderi, a member of their 2009 Cup team, who can help solidify the defense. They brought back Chris Kunitz, Pascal Dupuis and Craig Adams. And at least they’ve locked up Evgeni Malkin and Kris Letang after locking up Sidney Crosby last summer. It was always going to be impossible to keep the 2012-13 team together, which is why the four-game flameout in the East final was so disappointing. Detroit Red Wings: GM Ken Holland failed to land the big free agents last year, striking out with Ryan Suter and Zach Parise. It was supposed to be evidence that the Wings had lost their luster as Cup contenders, that Detroit was no longer a free-agent destination. But the Wings made the playoffs for the 22nd straight season and came within a win of the Western Conference final, and now they have swiped leaders from two teams that will be division rivals when they move to the East in realignment. They signed Alfredsson in a stunner. He can play with all their Swedes and skill players, and the commitment is for only one year. They also signed Stephen Weiss away from the Florida Panthers for five years at a $4.9 million hit. Those are almost the same terms Filppula got from the Lightning, but Weiss is a more consistent, two-way player. The Wings will lose Damien Brunner and maybe Dan Cleary, but if they gain a healthy Darren Helm, Todd Bertuzzi and Mikael Samuelsson, their main problem will be finding room for some young up-and-coming players. Dallas Stars: Jim Nill earned his opportunity to be a GM after so many successful years as an assistant GM in Detroit, and he has taken advantage of it. He paid a lot for 39-year-old defenseman Sergei Gonchar, trading for his rights and giving him two years at a $5 million cap hit. But the Stars badly needed experience and offense on the blue line. He reshaped his center position with two trades Thursday, acquiring Seguin, Peverley and Shawn Horcoff. Seguin moves Jamie Benn back to his natural position on the wing – and if Seguin reaches his potential, he’ll be a centerpiece. Peverley and Horcoff add badly needed veteran presence. Dan Ellis is a solid backup goaltender. Edmonton Oilers: The Oilers don’t need youth. They don’t need offense. They need experience and defense, and they got that by signing Ference to a four-year deal with a $3.25 million hit and center Boyd Gordon to a three-year pact with a $3 million hit. Ference brings a Cup ring, and he’s an Edmonton native who tweeted a picture of himself as a child in Oilers gear. Gordon is a shutdown centerman who wins faceoffs. Maybe a little heavy on term for Ference and dollars for Gordon, but all things considered in this market, two solid moves by new GM Craig MacTavish. New York Islanders: The Islanders re-signed goaltender Evgeni Nabokov. They also made the kind of move that draws no attention on a day like this but the kind of move that pays off in the long run. They signed Travis Hamonic to a seven-year deal at a cap hit of $3.8 million. Hamonic who? Yeah, he flies under the radar with the Isles, but Hamonic is a solid defensive defenseman who is only 22 years old. He traded some future earnings for security. By giving him seven years, the Islanders lowered the cap hit almost as much as possible and locked him up. The Isles also added nifty playmaker Pierre-Marc Bouchard up front.